The mission of Saudi Readymix’s Research & Development (R&D) is to identify opportunities, threats and challenges in the construction industry, and to develop innovative and competitive construction products and solutions that fulfill our operations and our market’s needs. We lead, and coordinate research and development (R&D) activities through our state-of-the art laboratories. We articulate networks, and provide platforms to maximize the use of our facilities and resources—fostering agile technology transfer. The Saudi Readymix’s Research & Development (R&D) was inaugurated in 2011 in Eastern Region of Saudi Arabia at Dammam New Industrial City. Our testing activities manned by leading concrete technologists to focus on cutting edge work in concrete mix designs and materials. Saudi Readymix is the only ready-mixed concrete company in Saudi Arabia currently engaged in continuous technological research and education. 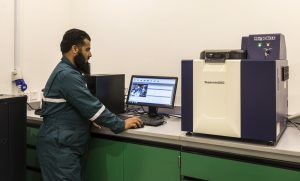 In addition to our testing programs, we at Saudi Readymix are involved in a wide variety of research and development such as, qualification and selection of raw materials, admixture analysis, new product development and applications research. Saudi Readymix’s central laboratory in the eastern region of Saudi Arabia, is constantly developing new mix designs with enhanced properties using high-performance materials such as micro silica, fly ash, ground granulated blast furnace slag, fibers, special chemical admixtures, and different blends of coarse and fine aggregates. The developed new mix designs help Saudi Readymix provide innovative and efficient solutions to meet all the needs of the Kingdom’s construction sector. Saudi Readymix is a corporate member of many prestigious standards’ organizations and is in continuous contact and collaboration with leading national and international research institutions relevant to the industry. Saudi Readymix has always been a pioneer in this field and we strive to continue to raise the bar.